Manila, Philippines - Eight (8) men reportedly involved in the drug trade were killed in Manila on Sunday (03 July 2016) morning even as the wife of one of the victims denied that her husband was a drug pusher. Six (6) were killed separately among the eight (8) suspects in firefights with the police in Quiapo and Tondo. The remaining two were found dead on Palanca Street, also in Quiapo, with notes claiming that both were drug pushers found on top of their bodies. Five (5) of the suspects were shot dead in what the police said was a follow-up antidrug operation in the Golden Mosque compound in Quiapo, an area with a reputation for rampant drug use and dealing. She admitted that her husband was a drug user although he stopped after their daughter’s birth a year ago. Chief Insp. Michael Garcia of the Barbosa Police Precinct led the operation in Quiapo. In a report submitted to the MPD (Manila Police District) homicide section, the 06:00 AM. operation at Golden Mosque was described as a “follow-up against a suspect involved in a shootout” with Sta. Cruz antinarcotics policemen. The report added that the operation was based on information that there was “a group responsible for the transportation and shipment of illegal drugs” in the area. At press time, however, only two of those killed, Bonifacio and Mohammed Ameril, had been identified by their families. Police said the five men yielded two .45-cal. and two .32-cal. handguns, P2,650 in cash and less than 200 grams of “shabu” or methamphetamine hydrochloride. On Road 10 in Tondo, policemen shot dead Gilbert Pondario in a buy-bust operation at 4:25 a.m., according to Supt. Redentor Ulsano of the Raxabago police station. 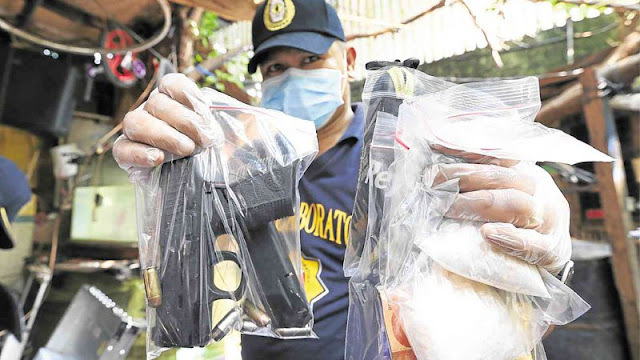 Seized from him were a homemade gun, four bullets and four sachets of suspected shabu. In Quiapo, two unidentified men were found dead on C. Palanca Street. “Their faces were covered with duct tape while nylon cords were looped around their necks. Both had a sheet on paper on their chest with ‘pusher’ written on it,” said a report by PO3 Marlon San Pedro of the MPD homicide unit. Cases of suspected drug pushers being killed have gone up since President Rodrigo Duterte urged the police to eliminate those who resist arrest.